We launched our PIP-UK Tumblr page this weekend. We found some great accounts of people sharing their stories on Tumblr and decided it was about time we joined in! Of course we had to add our best picture as the header for the page and our logo. 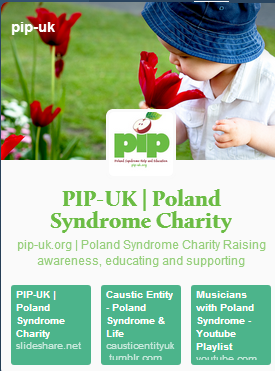 One of the aims of PIP-UK is to raise awareness of Poland Syndrome. So over the next few months we will be expanding into some near areas of social media. You’ll see from our post the other day we also now have a slideshare account. We’ve rebooted our Twitter account and spent the first 6 months of this year concentrating on our Facebook Page. Slowly bit by bit we are growing. We are expanding the family and getting to know more and more people. You can help us by sharing and following us and posting and commenting ! !